Israel will transfer the bodies of two suicide bombers to the Palestinian Authority (PA) on Sunday, Arab-language media outlets are reporting. Both bodies belong to bombers who attacked in Jerusalem. One of them, Ayat al-Akhras, attacked in Kiryat Yovel in March 2002, murdering two people. She also killed security guard Haim Smadar. Smadar’s quick thinking during the attack saved lives: he noticed that two Arabic-speaking women had left the area after speaking to Akhras, and managed to prevent her from entering the store, where her bomb could have caused many more casualties. The Fatah organization, the party of PA Chairman Mahmoud Abbas, has previously glorified Akhras as a "master of the world." PA officials have declared that the teen "died a martyrs' death." The other body is that of Daoud Abu Sway, who carried out a suicide attack near David Citadel Hotel in Jerusalem in 2001. Several people were wounded in the attack. Israel has transferred the bodies of six terrorists to the PA so far, in addition to releasing several dozen imprisoned terrorists. The transfers have been part of the ongoing Israel-PA negotiations. 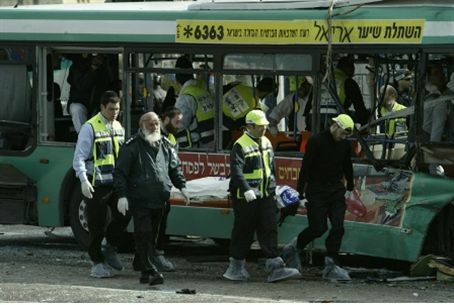 A total of 36 terrorists’ bodies are to be transferred to the PA, along with a total of over 100 terrorist prisoners. The released terrorists have been welcomed as heroes by PA leaders.